You may have seen these messy bun hats popping up all over Pinterest. They’re a combination between a hat and a wide headband with an opening on top for you hair. They’re perfect for any kind of outdoor activity because you can wear your hair up and have a hat on at the same time #BestOfBothWorlds. 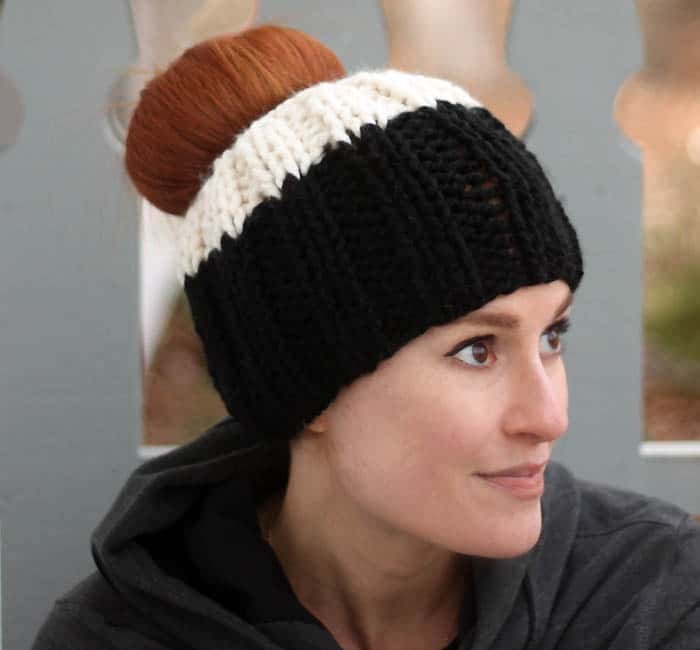 My Bun Hat Knitting Pattern is super easy to make. It’s knit in a basic rib stitch. The large needles and bulky yarn make for a very fast project. This messy bun hat has become my new favorite running accessory! I prefer to wear my hair up when I run but when it’s cold (and I’m wearing a hat) I have to resort to a braid. I never liked the sensation of the braid slapping against my back as I ran. I’m glad a found a solution! Want more of my free Knitting Patterns? Cast on 48 sts. with the black yarn. Join together. Work in K2, P2 ribbing for 4 inches. Switch to the white yarn and knit 4 more rows. Break yarn, pull through remaining sts and pull to tighten. Weave in ends. What is the needle size for this pattern? I know it says to "click above" to find the needle size, but no matter which link I click I can't seem to find it. Thanks! Just hold your pointer over the blue description of the needle, and it will show you. This one is US-13 16" circular needle. Oppie, where did you find it? Hi there! Where did you find it? WHERE did you find it??? When you decrease, do you use dp needles or keep using the circular needle? Love this! Made mine with Bernat Blanket using 10.0MM (US size 15) needles on a 24 inch circular. Since the yarn is a Super Bulky (6) I used the 'traveling loop' rather than magic loop as the stitches just kept wandering. The traveling loop worked all the way through all the decreases just fine. Thank you SO much!